If you are looking for a full spectrum indoor grow light LED with max energy saving, 4'x4 or 3'x3' tent/grower indoor plant use, then Hi-Sdard LED grow light will be your best choice. Thanks to the optical lens technology, this 1000WLED grow light obtain 30% higher PAR value, but consume 158W in real power. >Must handle it in a high ventilation area and within -20~40℃, 45%~95%RH work environment. >Do not worry about the IR diodes looks dim instead, it plays an important role in the flowering and fruiting stages of plants. ·2 Years Warranty: Return and money back for customers within 30 days. ·Strict quality control procedures for every single unit of LED Grow Light 1000W. ✔ 1000 watt led grow lights combine optical lens technology (better than reflector series), increase 30% loss of lights with higher PAR than any other brands on the market. ✔ Optimal 12 different bands of light full spectrum, provides indoor plants all stages with the same they desire in the natural sunlight with this 1000W LED grow lights for greenhouse. 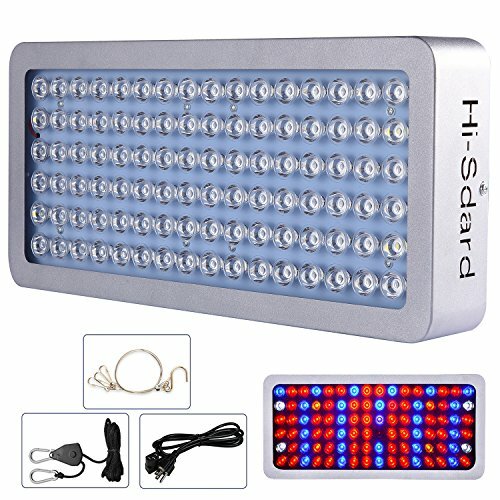 ✔ Compare with 1000 watt traditional HPS/MH, Hi-Sdard LED grow lights for indoor plants only consume 158 Watts real power, ensures maximum yield with minimum power usage and heat, impressed when you get the electricity bill with low rate. ✔ Switchable VEG/BLOOM Channel - VEG regulates the production of chlorophyll for seedling growth, Bloom stimulates overall growth throughout the plants for fruit and flowers. Veg/Bloom features a more Red/blue heavy output to deliver maximum performance from seedling through final flower. ✔ What You Get - 2 years worry-free warranty and 30 days money back guarantee, complete 7 days a week friendly customer support via phone or messaging for your LED Plant Light solution. If you have any questions about this product by Hi-Sdard, contact us by completing and submitting the form below. If you are looking for a specif part number, please include it with your message.